CF (designers Catellia and Fiorani) had started building powerful little 173 cc and 248 cc OHC singles in 1928. They were very successful in racing. In 1937 the CF factory was taken over by the Fusi firm, which were the Italian FN importers. Next to the racing types with OHC engine, Fusi produced machines with J.A.P. engines that were built in Italy under licence. Fusi used gearboxes that were actually Burman designs produced under licence by Fiat. 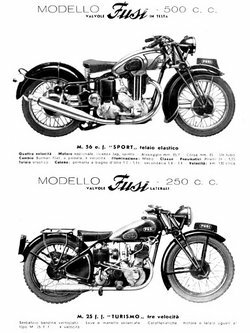 Fusi, a motorcycle manufacture in Milan, representative of the Belgian FN, built in 1932, the RAS bike with 175 cc Japa engine valves in the head and a Burman three-speed transmission. The owner, Achille Fusi, died in 1932 and the company direction was taken over by Luigi Beaux. 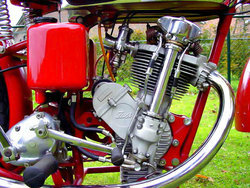 Soon after, the name of the bikes passing from RAS to Fusi and produced the 250 M Sport camshaft front cylinder and tilted, the Touring M 250 had a valve head controlled by rockers with an upright positioned engine and Fusi 500 valve head controlled by rods and rockers in versions with one or two exhaust pipes. In 1934 the models available had either a 250 and 500 cc JAP engine. 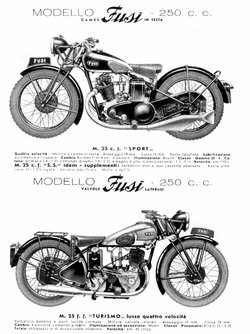 At the end of 1935 a 250 cc motorcycle was built with a Fusi engine, distribution camshaft in the front of the head on the vertical shaft. 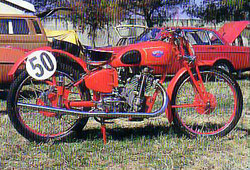 In 1937, he added Motofurgoni in several versions with JAP engine of 500 cc, built in Italy under license. The same year, they bought the patents off of CF, so the bike with this mark with 250 cc were produced under the Fusi trademark. In 1941, the M25 model produces the CFS of 248 cc with distribution to overhead camshaft and pedal commanded four speed transmission. Of this model they also produced the M25 CFSS, with the same characteristics but was capable of reaching 135 km/h. The M56 SBB had a 448 cc engine with valve head with the valves operated by rockers, then followed the M25 FFT engine with 248 cc and distribution with side. Between 1948 and 1949, the company built the CF M25 and M25 Sport Luxury CF Super Sport models, both single-cylinder valved engine with vertical, slightly inclined forward with 250 cc. In 1950, they entered the CFS and M25 in the same period, the BM, moped with the Garelli Mosquito engine. In 1950/51, it produced the model M25 CF SS, improve the previous year. Fusi ended production towards the of 1957. 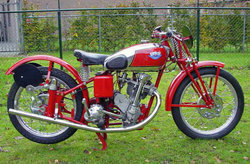 1937 Fusi Sport 250, 248 cc OHC racing model engine# 3812 C.F.S. The firm of CF (designers Catellia and Fiorani) had started building a powerful little 173 cc and 248 cc face cam OHC singles in 1928. They were very successful in the racing circuit. In 1937 the CF factory was taken over by the Fusi firm, which were the Italian FN importers. Next to the racing types with OHC engine, Fusi produced machines with J.A.P. engines that were built in Italy under license. Fusi used gearboxes that were actually Burman designs produced under license by FIAT. This beautifully piece of engineering art and had a four speed foot change gearbox and square engine dimensions of 68x68 mm and the carburetors were Zenith with a Marelli magneto.